Back in 1980, when he was an undergrad in college, Jim Leonard Jr. wrote a fairly simple play, peopled with down-home, regular folks trying to live their lives in a small town in Indiana in the 1930s. Leonard pitted a preacher who has left the pulpit (with no desire to go back) against a town starving for faith during trying times. At the center of the conflict for C.C. Showers, the last in a long line of men of the cloth, is his relationship with the members of the Layman family, which includes young Buddy, a traumatized boy who can find water even though he is terrified of it; his sister Jennie Mae, who takes care of Buddy, but also harbors a bit of a crush on the good-looking, charismatic preacher; and Ferris, their stubborn, good-hearted father, just doing the best he can to keep his family together. 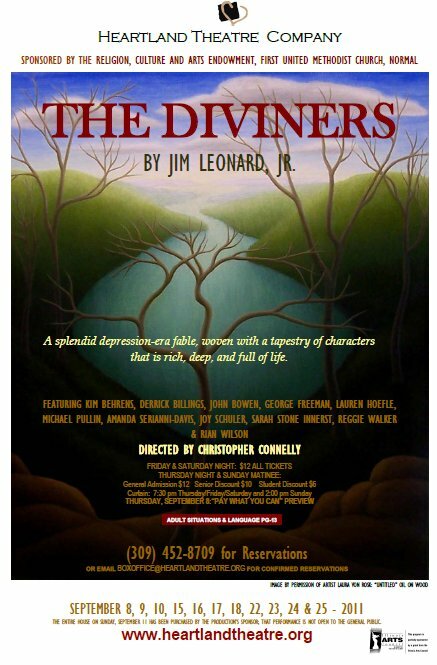 I suppose Leonard chose the Depression-era setting as a way to make his characters’ situation that much more desperate, but all the talk of unemployment and economic woes certainly makes “The Diviners” feel timely today. As for the play’s prevailing issues of religion and who has the right to control other people’s relationships to God or the church, well, that sounds pretty current, too. This is a play that truly belongs on the stage, as it needs tight direction, strong production values, and sympathetic performances to tell its story. I can't imagine its story coming off as vividly on the pages of a book or on film. There aren’t a lot of props or set pieces, and that only adds to the theatricality of the experience. But it also means that the script asks a lot of its designers and performers; the good news for Heartland is that they deliver in all the right places. Among the cast, John Bowen is terrific as C. C. Showers, making the reverend charming and laid-back one moment, fire and brimstone the next, keeping him right at the center of the action; Rian Wilson delivers a very impressive performance as he gives Buddy the depth (as well as the tics and layers) to break our hearts; George Freeman steps up and knocks it out of the park as Buddy’s feisty dad; Lauren Hoefle is sweet and pretty as young Jenny; and Michael Pullin adds just the right folksy gravitas as Basil, a farmer who also fills in as a doctor of sorts around Zion, Indiana. I also liked Amanda Serianni-Davis as a young woman chafing under her aunt’s strict rules, and Reggie Walker and Derrick Billings as a couple of rural swains. Sarah Stone Innerst, Joy Schuler and Kim Behrens round out the cast nicely as the ladies in town who can only see faith one way. Scenic Designer Michael Pullin adds texture and atmosphere with a ramped, bare-wood playing space that changes easily from the inside of a diner to the top of the trees, while Lighting Designer Tommy Nolan amps up the mood as he casts dappled light and deep shadows across the stage. Costume Designer Brianne Berogan keeps the characters down-home and easy with weathered brown and gray costumes. By the end, this “Diviners” raises a lot of questions about faith, trust, and community. It doesn’t answer all of them, but it definitely puts on a good show. Cast: Kim Behrens, Derrick Billings, John Bowen, George Freeman, Lauren Hoefle, Michael Pullin, Amanda Serianni-Davis, Joy Schuler, Sarah Stone Innerst, Reggie Walker and Rian Wilson. Performances: September 15-18 and 22-25, with Thursday, Friday and Saturday curtain at 7:30 pm and Sundays at 2 pm. For more information or to reserve tickets, click here. It was wonderful! I'm sending people!